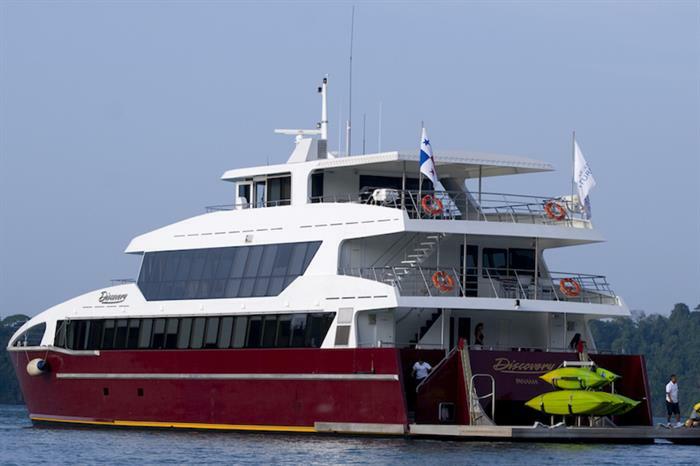 Discover the natural and cultural beauty of Panama on board of the Discovery cruise Yacth. This amazing journey will take you to the Darien National Park in search of amazing wildlife and for a cultural exchange with one of our distinct indigenous groups: the Emberas. We will also navigate the Pearl Island Archipelago and will have the unique experience of a crossing the renowned Panama Canal. This will be combined with historical tours while walking the legendary trails of the of Pirates and Conquistadores that once fought in the Isthmus that changed the world. Day 1 – June 5, 2018 Welcome to Panama! Today at the appropriate time an EcoCircuitos representative will meet you at the Tocumen International Airport to assist and transfer you to your hotel located in Panama City. You will also receive an EcoCircuitos information kit. Upon your arrival at your hotel please check in. Once you arrive at Tocumen International Airport you will first go through immigration, then you will proceed to pick up your luggage. After you have your luggage you will need to clear customs and agriculture, you will pass all your luggage through an x-ray machine. Then you will proceed to exit the area, once you pass through the exit door you can go either to the right or the left. EcoCircuitos Panama recommends that you go to the right to better locate our staff who will be receiving you with a sign bearing your name with the company’s logo. Then transfer to your hotel in the City. Overnight hotel Central or similar. During the half-day morning tour, you will visit the ruins of Old Panama, climb up the Cathedral tower, visit the Old Panama Museum and then continue to Casco Viejo (the old city compound), which dates back to the late 1600’s. A bilingual guide will describe the events in history leading up to the eventual movement of the capital city to its present location. Casco Viejo is home of monuments of Ferdinand de Lesseps and other Frenchmen instrumental in the ill-fated attempt of the French to construct a canal through Panama. The full-day tour continues to visit the Biodiversity Museum designed by Canadian-American Architect Frank Gehry, the Biomuseo is his only work in Latin America and the tropics. The building was designed to tell the story about how the Isthmus of Panama rose from the sea, uniting two continents, separating a vast ocean in two, and changing the planet’s biodiversity forever. The Biomuseo’s 4,000 square meters contain 8 permanent exhibition galleries designed by Bruce Mau Design. An expert from the Museum will conduct the visit. In addition to the main spaces, the museum includes a public atrium, a space for temporary exhibitions, a shop, a cafe, and multiple outdoor exhibits displayed in the botanical park. The permanent exhibition is a combination of art and science that leads the visitor to experience a marvelous phenomenon. Today you will arrive Flamenco Marina and disembark the Discovery. Our guides will meet you for another exciting adventure. Our EcoCircuitos naturalist guide will pick you up at the pier for a ride to the scenic Gamboa Road to Pipeline Road located in the Soberania National Park. You will experience a unique tour exploring the canopy of the Soberania National Park; you will be fascinated by the beautiful view of the forest, the lake and the national parks that protect the canal’s watershed. The upper rainforest canopy at the Rainforest Tower is 30 meters high with emergent trees reaching 40m. Our naturalist guide will explain you the wildlife that you will observe during this trip and you will learn about the sustainable use of water and the recycling materials of this great educational facility in the core of the forest. Along the way, watch out for Green iguanas and three-toed sloths resting on tree branches, Ospreys in the hunt for Peacock basses, Snail Kites and Keel-billed toucans, amongst many other wildlife species. Look for the White-faced Capuchin, Mantled Howler Monkey, Central American Spider Monkey, and Geoffrey’s Tamarin among other species. At the appropriate time, you will be transferred to the Tocumen International Airport for your outbound flight. You will arrive at the airport approximately 2 hours before your departure time. Only for wholesalers and their travel agencies with certification.